Find out where to get some free pretzels on National Pretzel Day. April 26 is National Pretzel Day: a day to celebrate pretzels. Pretzels are more than just a quick snack, they’re a part of history that, according to some, dates back as far as 610 AD. Over time, the desire for pretzels hasn’t become extinct as Americans consume an average of 1.5 pounds of pretzels per year, supporting an industry that has an annual value of over $550 million, according to National Day Calendar. And in honor of Americans’ love of pretzels, here are some deals that will get you a free pretzel — or two or three — and save you money. Auntie Anne’s: If you have the My Pretzel Perks app, you can get a free Original or Cinnamon Sugar Pretzel between April 26 and May 1. Plus, if you download the app by April 25, you could be one of five people who will win free pretzels for a year. Ben’s Soft Pretzels: Donate $1 or more to the Intrepid Fallen Heroes Fund and get a free Jumbo Soft Pretzel. All proceeds go to the Intrepid Fallen Heroes Fund. Philly Pretzel Factory: Receive a free pretzel on April 26 at most locations. This offer might not be valid at locations in aquariums, zoos, airports or train stations. Pretzelmaker: Share a kind message on social media using the hashtag #warmthoughts and show it in-store or compliment a Pretzelmaker team member and get a free original or unsalted soft pretzel. Snyder’s of Hanover: Snyder’s will be giving away thousands of free bags of boldly-flavored Pretzel Pieces near baseball stadiums in eight cities (Atlanta, New York, Denver, Washington D.C., Chicago, Detroit, Minneapolis and San Francisco) on April 26. SuperPretzel: Save $0.75 with this printable coupon until May 8. You can also join the email list to get special coupons that will be sent out on National Pretzel Day. Wetzel’s Pretzels: If you like or follow Wetzel’s Pretzels on any social media platform (Facebook, Instagram or Twitter) and show proof in-store via mobile device or printout you can upgrade from an Original Pretzel to a free order of Pizza Bitz on April 26 while supplies last. Non-participating locations include stadiums, amusement parks, convention centers and arenas. While supplies last. 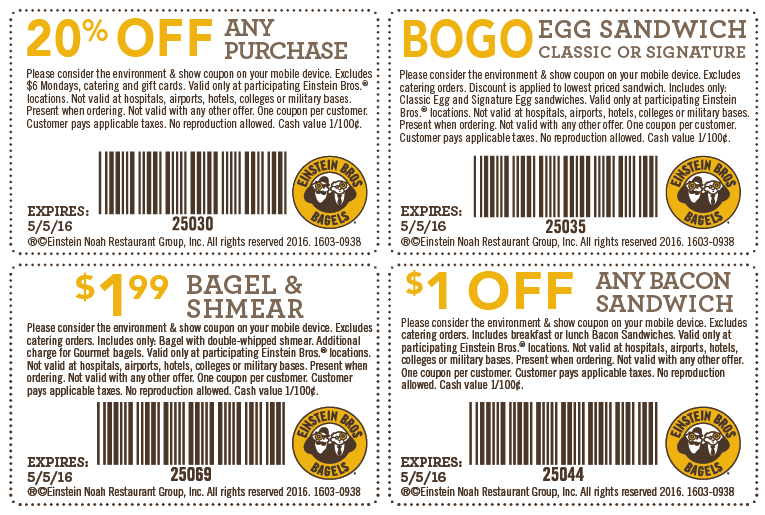 Einstein Brothers Bagels: Save 20 percent off your purchase with this printable coupon until May 6. IHOP: Get a free kid’s meal with the purchase of an adult entree for dine-in only until May 6. Marie Callender’s: Get one free breakfast entree when you purchase another breakfast entree and two beverages with this printable coupon until April 28. Steak ‘n Shake: Buy one sausage or bacon, egg and cheese combo and get another combo free with this printable coupon until May 22. Best Buy: Save 20 percent off a regular-priced small kitchen appliance with this printable coupon until April 30. Hertz: Use promo code 107785 to save $5 a day on car rentals until June 15. There’s a $30 maximum and other restrictions apply. Remember, no matter the occasion, the best way to enjoy it is a way that saves you money — especially if that means free pretzels. Jamie Young contributed to the reporting for this article. From 4th of July BBQs to potlucks, here are some simple and inexpensive recipes to try. Score free java on National Coffee Break Day and all year long.